We can provide copies of entries and/or make these registers available. The Diocese charges a small fee for this service. Any records dating before these are kept at the Suffolk Records Office in Bury St. Edmunds (77 Raingate Street - opposite new Shire Hall and the Police Station). In most cases they are available on microfische or microfilm, though if they are not very clear staff will usually let you see the originals. The Suffolk Records Office (SRO) has a website at: www.suffolkcc.gov.uk/sro and they will sell you copies of documents (click on the 'Fische Details' on the left-had side). The staff in the searchroom are very helpful, so it might be worth calling them for advice. Their telephone number is 01284 352352 (or +44 1284 352352 if you are calling from overseas). You may also find the Suffolk pages at www.sog.org.uk/prc/index.html to be of help. Their staff will carry out a half-hour search for £15 and send you copies of any relevant documents. 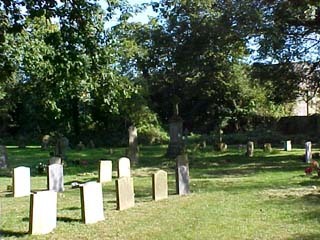 Unfortunately there have never been any plans kept of our church burial yard. This is a great pity as some graves are just mounds of earth and some headstones can no longer be read, due to weather erosion of the stones. However we are beginning to collect details and hope eventually to be able to provide the names of those buried here on the website; it will be a long process and will take many months to complete. For a small donation towards the upkeep of the church, the webmaster will see if he can track down specific names on gravestones, as long as you are in no hurry. You can send him an email by going to our 'Contact us' webpage.